In an allegation that should surprise no one, a new book claims that Republican Presidential frontrunner and all-around puzzling dude Mitt Romney once told a woman that she'd be barred from heaven forever unless she gave her baby up for adoption. Buzzfeed reports that the forthcoming book entitled The Real Romney says the incident happened when Romney was serving as a Mormon bishop. Peggie Hayes, 23-year-old divorced woman, found herself pregnant with her second child while she was a parishoner under Romney's counsel in Massachusetts. One day, Romney came over to her house to offer her some religious counseling, and encouraged her to give up her child to the Church's adoption agency after it was born, since the Mormon faith dictates that giving a baby up for adoption is preferable to single parenting. When Hayes balked at Romney's suggestion, Mittens told her that unless she followed Church teachings, she could be excommunicated. Romney clarified that Hayes' excommunication would make her unable to enter Heaven, so, in short, Mitt Romney told a pregnant lady that unless she did what he said with her baby, she might end up going to hell. Romney, of course, has denied that the incident occurred. Even if it had, he didn't have the power to excommunicate the woman; that power lies with a council of church officials. And keeping one's child to raise in a single parent environment isn't considered a grave sin worthy of excommunication, either. Jesus Christ of Latter Day Jerks, you guys. Between the denying of the gay pride, the lifesaving abortion interference, and now this hellthreat, Romney's confusing and conflicting antics are getting ridiculous. His views are so wildly inconsistent that I'm beginning to think that Mitt Romney is actually two conflicted souls trapped in the same body, like Gollum from Lord of the Rings. One day, he's all about supporting abortion rights, but the next it's "NO! Abortions is killing the Precious!" He's on camera declaring that he's a nice, reasonable, progressive dude until PRECIOUS IS THE ARCH CONSERVATIVE. He's serving the poor in poverty-stricken neighborhoods in Boston until THE POORSES ARE STEALING FROM THE PRECIOUS! WE FIRE THE POORSES! 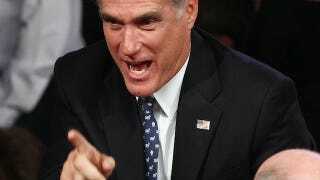 As a non-Republican, the frontrunner status of such a clearly flawed candidate should make me happy, but, on a personal level, I hope Romney can figure it out before someone ends up getting their finger bitten off.